Jaquan, on their front porch. 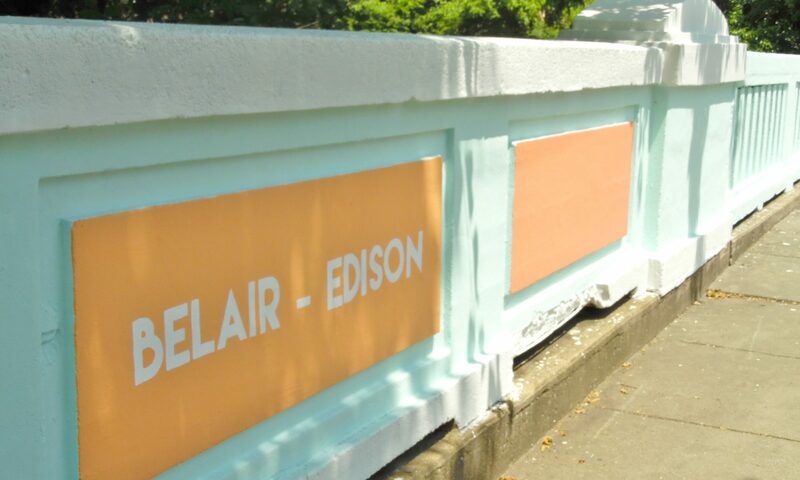 Belair-Edison was once a community plagued by high foreclosure rates and a stagnant real estate market. In the 80s and 90s especially, the area experienced a high rate of resident turnover. The instability in the housing market opened the door for many predatory practices and speculative investors. Belair-Edison Neighborhoods, Inc. (BENI) is a nonprofit, community-based organization that has been working to help strengthen the area. In 2000 they adopted the Healthy Neighborhoods approach, which focused on middle neighborhoods that could be losing their value. BENI set out to raise property values by implementing high standards for physical conditions. 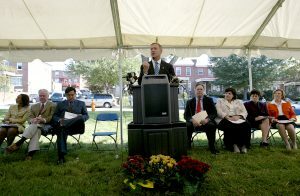 They wanted to get residents personally invested in the community and each other. With these initiatives BENI found they were able to boost community morale, confidence, and resident involvement. St. Ambrose serves as BENI’s development partner by acquiring foreclosed and distressed houses for beautiful renovation and sale to new homeowners. For more than 20 years, St. Ambrose has been dedicated to restoring and strengthening the Belair-Edison community, and in that time have renovated and sold 192 houses. Currently we are renovating 5 more houses in the community with another 3 awaiting a construction start date. The renovated homes complement BENI’s work to help establish and maintain high standards in the neighborhood. 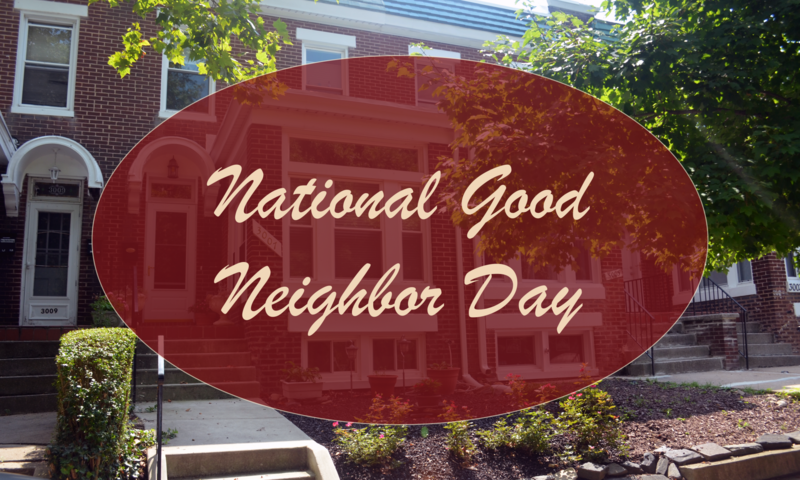 This in turn encourages neighborhood homeowners to make necessary repairs to their homes in an effort to maintain the integrity and value of the community. 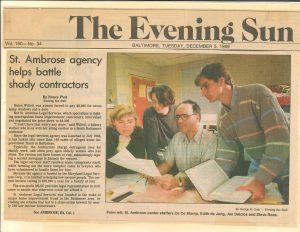 St. Ambrose has a long tradition of partnering with other organizations. We know we can achieve much more when we collaborate with others, who supplement our own skills or bring additional expertise that can broaden the scope of our projects. 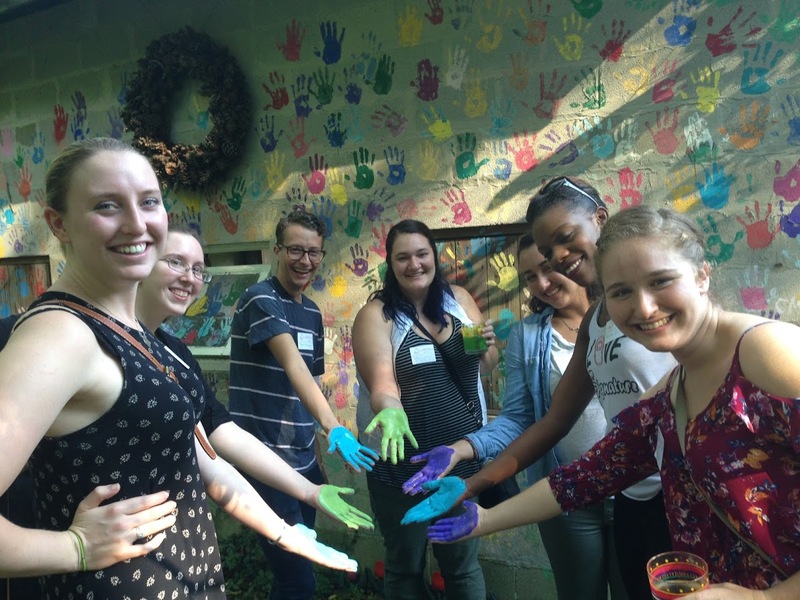 We are grateful to work with Belair-Edison Neighboorhoods, Inc., so that together we can offer a more comprehensive approach to community development. In 2006 the nation was experiencing an unbelievable spike in the number of foreclosures. From December, foreclosure rates would rise one-hundred percent over the next year. One of the primary reasons for this dramatic increase was the high number of adjustable-rate mortgages (ARMs) that were resetting to higher rates. Adjustable rate mortgages fluctuated with the market, and a monthly payment could easily double. It became too easy for homeowners to fall behind in payments, and consequently face the threat of foreclosure. With an estimated two million ARMs resetting in 2007, the problem quickly overwhelmed the nation. In response, the federal government established a HOPE Hotline where homeowners could call for advice about their loan payment options. However, the hotline did not use government officials. Instead it relied on non-profit organizations. 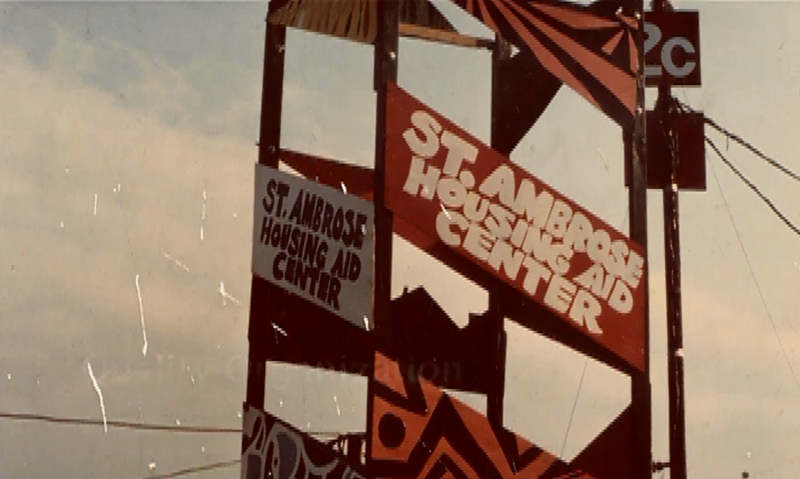 St. Ambrose was one of the many organizations prepared to help homeowners. Anticipating the extreme amount of calls from the hotline, St. Ambrose began adding and training new staff. Their team consisted of some exceptionally experienced default mortgage counselors, who were able to contact lenders, and help homeowners work out payment agreements. In a few special cases, staff attorneys were even able to reverse foreclosure proceedings. In 2007 St. Ambrose more than doubled their average number of clients to serve nearly 2,000 families. While comparatively the need is not as extreme, foreclosure prevention still remains an integral part of St. Ambrose’s services. In the last fiscal year, St. Ambrose counselors assisted 258 families with foreclosure prevention or financial counseling. Mayor and New Coalition announce assistance to homeowners facing threat of foreclosure during the 311 Initiative Kick-Off at Herring Run Park in Belair-Edison. Last week St. Ambrose received a donation of 25 book bags filled with school supplies from CohnReznick. Everything from notebooks, binders, scissors, and colored pencils were stuffed inside ready to be put to use by the students living in St. Ambrose’s rental properties, so they can start the new school year fresh. 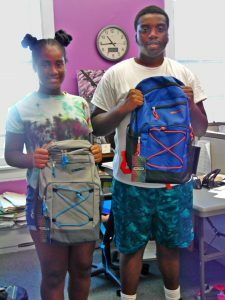 The students who received the donations range from kindergarten to seniors in high school. CohnReznick has been partnering with St. Ambrose since 2010. As a business located in downtown Baltimore, CohnReznick is always looking for a way to give back to the community that they call home. 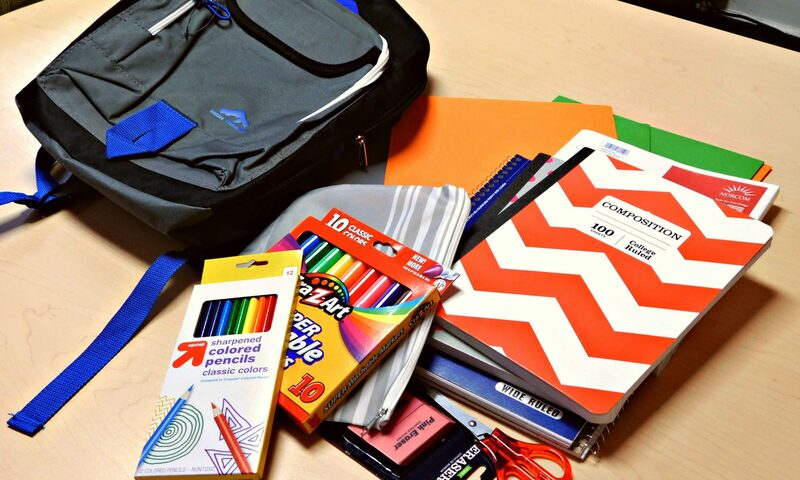 “What better way to serve the community than by ensuring that its future generation begins the school year with the materials they need to succeed,” says Lani Warsaw, a CohnReznick team member. As a company who often works with the affordable housing industry, St. Ambrose felt like a natural partner for their charitable outreach. Along with book bag donations, they also contribute to St. Ambrose’s Adopt a-family” campaign. 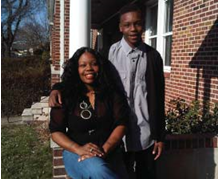 Trevon and his sister Akaya have been living in a St. Ambrose rental home almost their whole lives. When they come to pick up book bags, they warmly greet the familiar faces at St. Ambrose. Trevon will be a senior this year. He is excited about finishing his high school education as well as looking forward to a great final year with his football team. 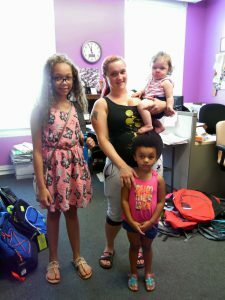 Tabatha comes in with her daughters to pick up a book bag for her oldest child, who will be entering 6th grade. They have been with St. Ambrose for 6 years. Tabatha tells her second oldest daughter that she will get a book bag next year when she starts Preschool. Tamierra is pictured here with our own Mary Ann. 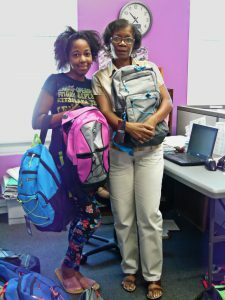 She picked up book bags for her 3 children, two in Kindergarten and one in first grade.